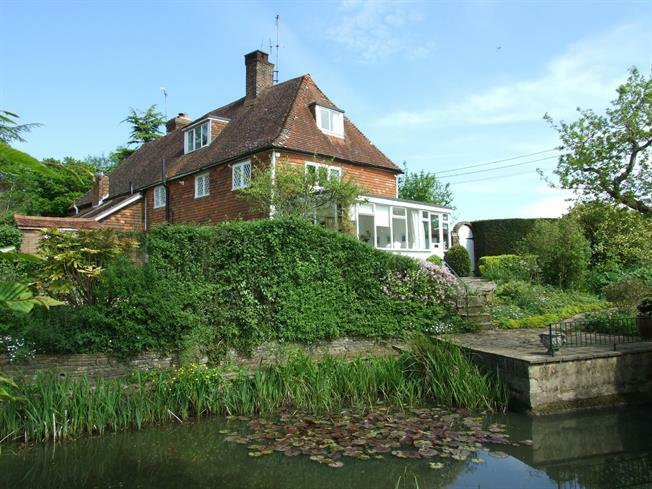 3 Bedroom End of Terrace Cottage For Sale in Robertsbridge for Offers in excess of £520,000. This charming Grade II listed end of terrace cottage offers surprisingly spacious accommodation over three floors boasting a wealth of period features including a large inglenook fireplace and wealth of exposed beams etc. The property has an LPG fired central heating system. The front door opens to the entrance hall where double doors lead to the spacious sitting room that has a double aspect, beamed ceiling, large inglenook fireplace and opens onto the sun lounge that overlooks the delightful gardens and enjoys far reaching views. There is a spacious kitchen/dining room with a double aspect, beamed ceiling and is fitted with a range of floor and wall mounted units. The cloakroom is approached from the rear lobby. On the first floor is a spacious master bedroom with a triple aspect over the gardens and surrounding countryside. Also approached from the landing is the second bedroom that overlooks the rear garden, and the bathroom. On the second floor is a room that is currently used as a study with a wealth of beams and door to the third bedroom. A driveway leads to the front of the cottage and an ample parking area. The gardens are a feature with a large pond bordered by a variety of mature shrubs and trees. At the rear of the cottage is an attractive well sheltered patio area with borders.